Thua Thien-Hue (VNA) - The iconic iron bridge Truong Tien in the former imperial capital of Hue is getting an overhaul in an effort to return it to its design under the era of the country’s last emperor Bao Dai (1926-1945). The bridge serves as a unique icon of the city and its beauty has been depicted in various songs, poems and paintings. 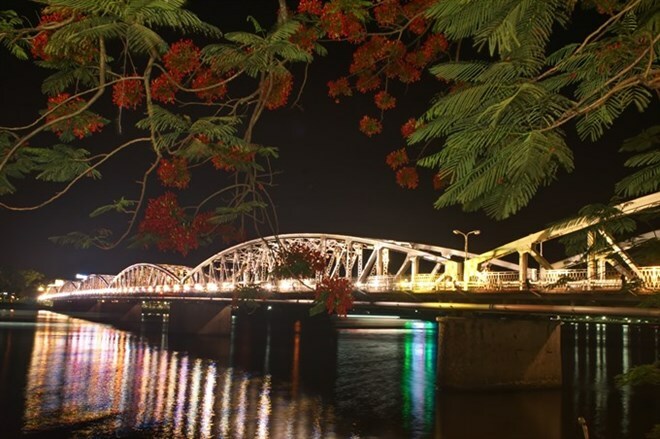 An agency under the Directorate for Roads of Vietnam based in the central region is repairing the bridge’s floor and corridors that allow pedestrians to enjoy the beauty of the Huong (Perfume) River. The agency’s Deputy Director Dang Nguyen Ngoc Linh said the bridge road would get a new asphalt layer while the two corridors running along its two sides would be paved with stone. Linh said 10 balconies in shape of half hexagons would be reinstalled into the corridors to make the bridge corridors look similar to its design during the final stage of the imperial age. The move has been welcomed by locals and visitors to the city. Dang Huu Vinh, an elderly man in the city, said the bridge would look better with the hexagon balconies, just like it was when Vinh was young. “This will embellish the city and today’s youth at the same time,” Vinh said. The iron bridge was first built and put into use in 1899 under the reign of King Thanh Thai. It spans over two banks of the Huong River and is 402m long and 6m wide, designed by French architect Gustave Eiffel. The bridge was broken twice due to storms and bombing and has been overhauled several times. The latest overhaul in 1991 removed the balconies and changed the bridge’s colour from silver to grey. Also, a contractor fixed a plate with the name, Trang Tien, a location in Hanoi, instead of the correct name Truong Tien at its two ends. According to Linh, this overhaul will repaint the bridge and fix the plates. The city’s authorities plan to pilot making the bridge a pedestrian one during weekends by this October. According to Vice Chairman of the municipal People’s Committee Nguyen Dang Thanh, all vehicles will be banned from traffic on the bridge every Saturday and Sunday. With the scheme, the bridge will be decorated with art installations and equipped with new light effects to enhance its beauty. The city will set up a food street near Dong Ba Market, which is located on the northern end of the bridge, and turn roads in the backpacker area connecting the bridge’s southern end to pedestrian streets. These, including the food street, the bridge and the pedestrian backpacker area will create a new pedestrian zone during weekends, aiming at drawing more tourists to the city. Le Dac Nguyen Quy, a restaurant owner in the backpacker area supported the scheme, saying he found pedestrian roads in Bangkok allowed tourists to have more fun, which means they will stay longer and spend more.